This week, Randolph Carter and his yak encounter the dreaded Shantak-bird. 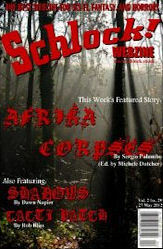 We also have the return of Sergio Palumbo (edited as ever by the indefatigable Michele Dutcher) with Afrika Corpses, which involves World War Two, Ancient Egypt and things even more sinister. There's also the conclusion to C Priest Brumley's The Stolen Other; an apocalyptic poem by Zak Dawson; a short tale of tenebrous horror by Dawn Napier; the continuation of Ayame's Love; an angelic romance by Rob Bliss; the second part of Michael Bray's That Gnawing Feeling; the concluding part of The Blood Eagle; and the continuation of Varney and After London. Tune in next week for the last issue of Volume 2, and the details of a competition, whose winners will see their work published in the upcoming Schlock! Anthology II: Timeless Worlds.